NuVue Pharma is a dispensary in Pueblo, Colorado serving all of Colorado. We have a state-of-the-art facility which has enabled us to be the leading cannabis production, oil extraction, medical (mmj) and recreational marijuana dispensary in the area. We grow our cannabis in-house and carefully cultivate and process. Due to our facility, we are able to provide the highest quality medicinal and recreational cannabis available on the market. Our marijuana store's shelves are always stocked with the best flower, concentrates, edibles, topicals and tinctures. At our Pueblo dispensary we offer daily deals, happy hour specials, BOGO offer and veteran’s discount on all purchases. We pride ourselves in being the first retail marijuana dispensary awarded a retail license in the City of Pueblo. We were the first Marijuana Grow-Off Team to receive awards in both the medical and recreational grow competition. 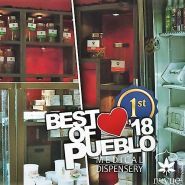 And were voted Best of Pueblo 2018 for our medical dispensary and runner-up for our recreational dispensary.